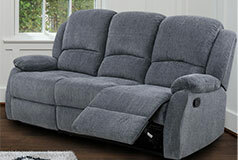 The Crawford Sofa Recliner is ultra-plush and comfy. 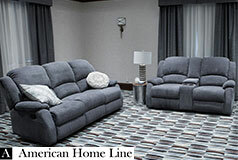 After a long day, you’ll love coming home to relax on your reclining sofa. 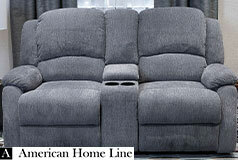 To recline, all you need to do is pull the manual latch. You can relax all the way back or sit more upright with your feet up. 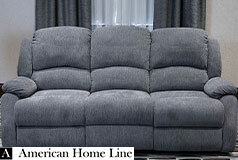 The sofa is upholstered in a chenille fabric made of durable polyester. 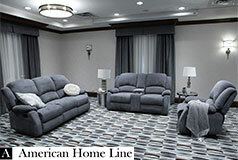 The fabric is ideal for active households, looking for a low maintenance fabric. 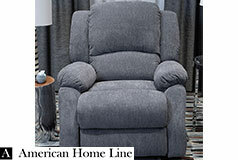 Key Features: The reclining sofa lets you recline in the position that’s most comfortable for you by using the manual latch located on the side of the sofa. (Note that the middle seat of the sofa does not recline).